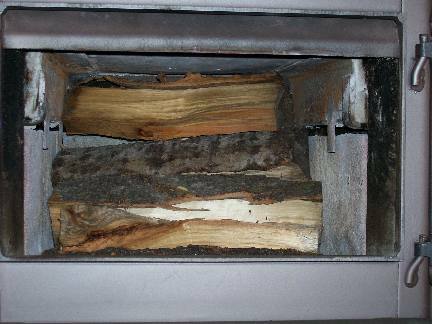 Everyone who heats with wood (especially those with a non-catalytic stove) struggles with the problem of controlling heat output during the relatively mild weather in fall and spring. Just turning down the air control when a stove is making too much heat can often result in more smoke pollution, creosote deposits and wasted energy. So here are five different techniques you can use to reduce heat output in mild weather while still producing a clean, efficient burn. A small, crisscrossed load for mild weather.In mild weather use light woods like poplar/aspen, pine or willow. When properly seasoned these woods light fast, burn fast and don't leave a big coal bed that can overheat the room the way hard woods like oak and maple can. Build smaller fires in mild weather and use larger loads in cold weather. In mild weather to create a short, hot, brightly burning fire, load the wood in crisscross form. 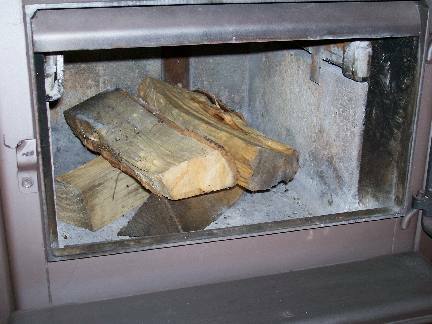 In cold weather for longer, higher output fires, load the wood compactly in the firebox. This is wood loaded east-west for low output, long burns. If you have a roughly square firebox floor, you can load the wood either east-west or north-south. Use east-west orientation in mild weather to get a long, low heat output, like for over night. The wood breaks down more slowly when the combustion air reaches it from the side of the pieces. In cold weather, load the wood north-south because the heat and flame can penetrate the load more easily and produce a higher sustained heat output. North-south loading permits more wood to be loaded, which gives a long burn despite the higher output. This is a big north-south load for a high output, long burn in cold weather. 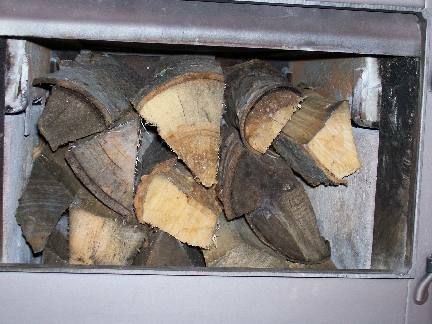 In the east-west load orientation the wood breaks down more slowly so it is good for overnight burns in relatively mild weather when high output is not needed. Here is a compact load oriented north-south. This type of fire produces a high output, long burn because heat and flame can penetrate the load and because more wood can be loaded than in the east-west configuration. Note that this is only one of five methods and it is last in the list. When reducing the air supply in manually controlled stoves, turn it down in two or three steps so you don't cause the flaming combustion to collapse. It may be tempting to keep the fire burning 24 hours a day so you can just rake coals and load wood instead of having to keep lighting fires. But this often leads to overheated rooms, smoldering fires and dirty door glass. Depending on the size of the stove and the size of the space it is heating, it is often better to let the fire go out and build one fire a day to take the chill off. A rough guide is to avoid overnight fires until the outside temperature falls to the freezing point.